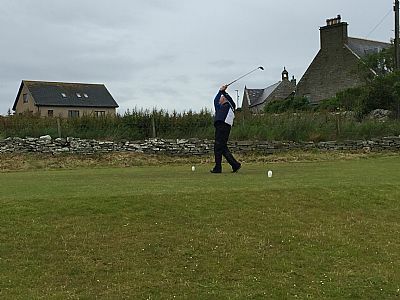 Saturday 8th of July saw 50 golfers compete in this years, earlier than normal, South Ronaldsay GC Open which was sponsored by the Orkney Hotel, Jewsons and the Murray Arms. Numbers were well down on previous years but that didn’t deter the competitive nature of this competition. The weather for the players out in the morning started dry and bright with a SW’ly breeze but this deteriorated to drizzle by midday. 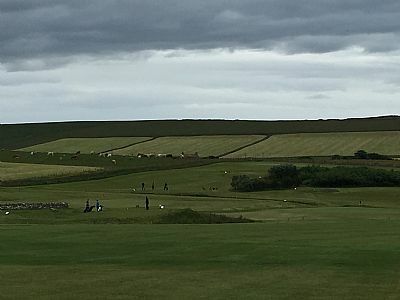 Through this changeable conditions came the days winning nett score from Derek Ward jr. who returned to the club with a 59 nett. This low score held out as the early groups returned and it didn’t look like anyone would be challenging Derek for the prize. 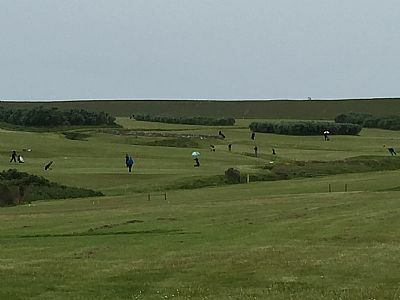 The breeze fell away and the rain got heavier for a spell for the afternoon groups with the last few groups starting off in the worst conditions with the breeze increasing again. The last group out had defending champion Neil Tait, Darren Sutherland and Graham Flett. 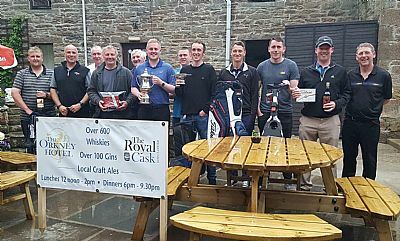 From this grouping came this year’s winner with Graham beating Neil by 2 strokes carding a very respectable 72 given the conditions throughout there round. After play, all golfers retired to the Murray arms for an excellent lunch and the presentation took place here at 8pm. 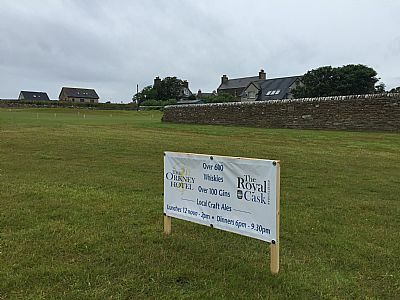 All in all, a very successful day was had and thanks must go to the following – The Orkney Hotel, Jewsons (Orkney) and The Murray Arms for sponsoring the event and to George Coltherd and Glenn Miller for all the work they have done with the sponsors. 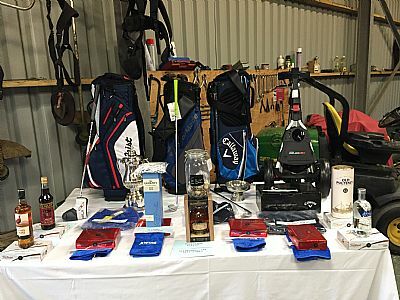 We must also extend a huge thankyou to Ben Lacy-Brown (greenkeeper) and Gary Drever, along with the various committee and members who volunteered to help, for the excellent condition of the course, a view that was conveyed by all who played on the day, also thank you to the ladies section for providing home bakes and sandwiches and to Alec and Jaqueline Rosie for manning the club while play was on and Davie Nicol for ensuring the early groups set off on time. Divion 1 prize winners 0-16 handicaps. Divion 2 prize winners 17-21 handicaps. Divion 3 prize winners 22-28 handicaps.